Michel Berger (born Michel Jean Hamburger; 28 November 1947 – 2 August 1992) was a French singer and songwriter. He was a figure of France's pop music scene for two decades as a singer and as a songwriter for such artists as Françoise Hardy, Johnny Hallyday, and his own wife, France Gall. He died of a heart attack at the age of 44. Berger was born as Michel Jean Hamburger on 28 November 1947 in Neuilly-sur-Seine, the son of Jewish parents, Dr. Jean Hamburger and Annette Haas, a concert pianist of Swiss-Jewish origin. Berger first became known to the French public in the 1960s as singer of hit song Salut les copains, after which he became record producer and songwriter for EMI and where he wrote amongst others Les Girafes for Bourvil in 1967. In the early 1970s, he moved to Warner Music where he produced the early albums of Véronique Sanson, and Allah once again in 1989. In 1973, he was responsible for producing the album Message personnel, the title track of which relaunched Françoise Hardy's career. He also produced the single Je suis moi for Hardy. Berger started writing for France Gall in 1974, produced all her albums from 1975 on, and married her on 22 June 1976. In 1978, he composed the musical: Starmania, with lyrics by Luc Plamondon. The musical starred Gall, Claude Dubois, Daniel Balavoine, Diane Dufresne, Nanette Workman, Éric Estève and Fabienne Thibeault. It was a big success in France in the 1980s and 1990s. An English version, entitled Tycoon, was released in 1991 with lyrics by Tim Rice, but it did not achieve the success the original version had in France. Unfortunately, the two musicals Berger worked on immediately after Starmania did not fare well. In 1980, Berger partnered with producer Jérôme Savary and lyricist Luc Plamondon to produce the musical La Légende de Jimmy, inspired by the life of James Dean. However, this bombed. Berger's next musical project, Dreams in Stone, was conceived as an American musical, co-arranged with Michel Bernholc, and recorded in the United States, with lead vocals by singers Rosanne Cash, Bill Champlin, Lynn Carey, Jennifer Warnes, and Bill Withers among others. Though the show itself never saw the light of day, the album was nevertheless released in 1982. The album was a complete flop, and is not generally known outside of a few fansites. Berger also scored several film projects over the years, which included Mektoub, a 1970 film by Algerian Director Ali Ghalem, Robert Benayoun's Sérieux comme le plaisir in 1975, Jean-Paul Rappeneau's Tout feu, tout flamme in 1982 and Rive droite, rive gauche the 1984 film by Philippe Labro. He was known for his Orangina advertisement jingle. 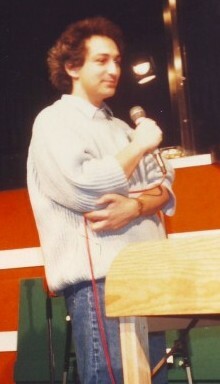 Berger was one of a handful of French artists who participated readily and actively in humanitarian acts: in 1985, he worked exclusively for Action Écoles alongside Gall, Richard Berry and Daniel Balavoine, then later for Ethiopia with Renaud (Chanteurs Sans Frontières) and for Les Restos du cœur with comedian Coluche. On 2 August 1992, weeks after the release of his first album of duets with France Gall, and six months after the death of his father, Berger suffered a fatal heart attack after a tennis match at Ramatuelle. His death came as a shock to many as he had been one of the most popular French singer-songwriters of the 1970s and 1980s. Moreover, unlike many pop stars, he came across as a nice and simple man, more interested in music and family life than in rock & roll excesses. Indeed, his marriage to Gall was remarkably stable. Berger was buried in Paris, in the Montmartre cemetery. His daughter Pauline, who died in 1997 aged only 19, is buried close by. He was also the father of French music supervisor, Raphael Hamburger. "Diego, libre dans sa tête"
"Chanter pour ceux qui sont loin de chez eux"
Berger, alongside fellow musicians Michel Fugain and Michel Sardou, appeared as extras (uncredited roles) in the 1966 René Clément film Paris brûle-t-il? (English title Is Paris Burning?). Berger played the role of "Chef des explosifs", whereas Fugain and Sardou appeared as student protestors. ^ Steffen Hung. "Discographie Michel Berger". lescharts.com. Retrieved 2012-08-23. This page was last edited on 27 February 2019, at 16:26 (UTC).